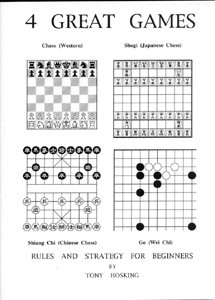 The beginner's guide to Western chess, shogi (Japanese chess), shiang chi (Chinese chess) and go (wei chi). The first single in-depth guide to these games in English, based upon professional games and analysis. Clear explanation of the rules and fundamental strategy of each game. Comparison of overall strategy and tactics in the 3 king-hunting games of chess, shogi and shiang chi, and then with the more territorial game of go. Detailed openings guide in each game for more advanced study. Chess, shogi and shiang chi have some similar pieces - kings, rooks, bishops, knights, pawns - and the winning goal is capture of the opponent's king. In the Oriental game of go captives only count towards the winning goal of surrounding greater overall territory. These 4 great games share some fundamental strategic and tactical ideas. Each game has principles of play which apply to the others; so playing one can help learn and improve play in another. Enjoy playing chess, shogi, shiang chi and go - there is fascination and beauty in all!